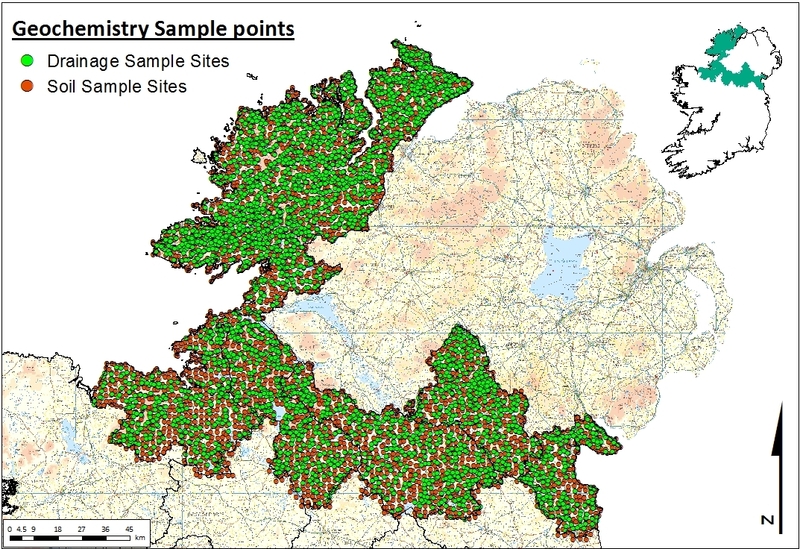 The Tellus Border team are currently working on newly acquired chemical data for samples collected from across the countryside of counties Donegal, Sligo, Leitrim, Cavan, Monaghan and Louth. With the aim of integrating these with existing geochemical data from across the counties of Northern Ireland, the results are currently being investigated and comprehensive data quality control procedures are being applied. The will be documented and available to reference. It is anticipated that the checked and conditioned (fit-for-purpose) chemical datasets will be made available. Please check the website for regular updates, and register for email notifications here. The Tellus Border geochemical field survey collected samples of soil, stream water and stream sediment from approximately 7,000 locations across the border region in 2011–2012. These samples have now been chemically analysed to investigate the baseline or background environmental concentrations of a range of inorganic chemical elements. A summary of the chemical element determinands and analytical methods used in the Tellus Border project are listed below. Why survey the elements in the environment? The aim of collecting and analysing samples of soil, water and sediment is to understand the chemical make-up of these samples, and to enhance our understanding of the sources and mobilities of chemical substances in the near-surface Earth environment. Scientists can use these data to investigate how the rocks beneath us are influencing the soils, sediments and waters around us. Geochemistry is the link between geology - the study of rocks and how they form, and the chemistry – what elements make up our rock, soil and water. Helping geologists to characterise the nature of rocks and minerals beneath the Earth’s surface. Applications for improved land management and agriculture, such as understanding where trace elements and micronutrients may be deficient or excessive. Investigating potential ecological, animal and human health risks, such as potentially harmful elements in soil and water. Underpinning environmental policy and feed into improved regulatory frameworks. The Tellus Border geochemical baseline survey provides a snapshot in time, against which future environmental change and impacts on soil, sediment and water may be measured and mapped. In total approximately 7,000 sites were visited over the course of the survey; approximately 1 sample per 3.5 km2. These locations are quite randomly distributed, so no individual landowners were targeted. The sampling methods involved the collection of small volumes of samples by hand, and the sites we visited were left undisturbed. The field sampling surveys are now complete. The field survey was carried out on behalf of the Geological Survey of Ireland by OCAE Consultants Limited. The sampling methodologies are based on those developed by the British Geological Survey G‑BASE programme. Samples of stream sediment and soil require specialised preparation for analyses. Archives of additional sample material are retained, for future use and research. K, Ca, Ti, Mn, Fe, S, Cl, Sc, V, Cr, Co, Ni, Cu, Zn, Ga, Ge, As, Se, Br, Rb, Sr, Zr, Nb, Mo, Nd, Sm, Yb, Hf, Ta, W, Tl, Pb, Bi, Th, U, Ag, Cd, Sn, Sb, Te, I, Cs, Ba, La, Ce, Na, Mg, Al, Si, P, Ba, Y, In. NPOC, Cl-, SO42-, NO3-, Br-, NO2-, HPO42-, F-, Li, Be, B, Na, Mg, Al, Si, P, S, K, Ca, V, Cr, Mn, Fe, Co, Ni, Cu, Zn, Ga, As, Se, Rb, Sr, Y, Zr, Nb, Ag, Cd, Sn, Sb, Cs, Ba, La, Ce, Pr, Nd, Sm, Eu, Tb, Tm, Yb, Lu, Hf, Ta, W, Tl, Pb, Bi, Th, U, Ti, Mo, Gd, Dy, Ho. *Not all samples will have data for all determinands, depending on the analytical capabilities and nature of the samples themselves.